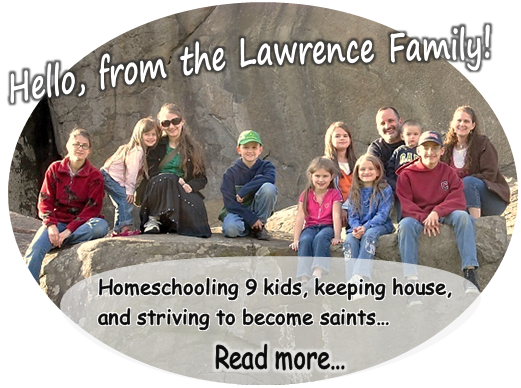 Become "fishers of men" anytime or place! (Except in the rain or in the pool - the game is made of cardboard- it would get soggy! lol!) 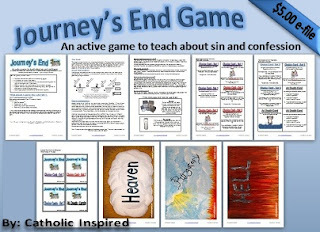 This cute game is not only fun, it's also a great way to get kids to remember some key ideas of life. 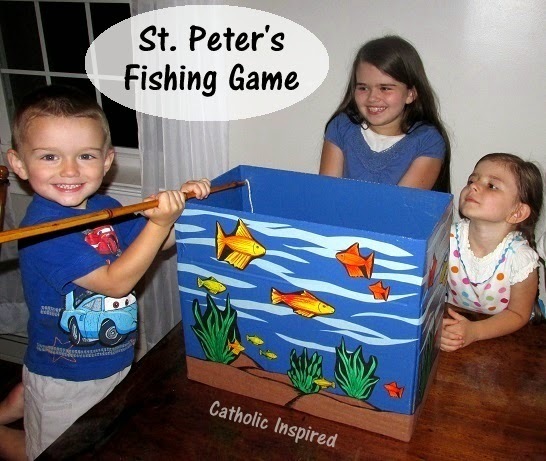 This fishing game is an old favorite for my kids! We made several different fishing boxes over the last 10 years and each have been well loved! 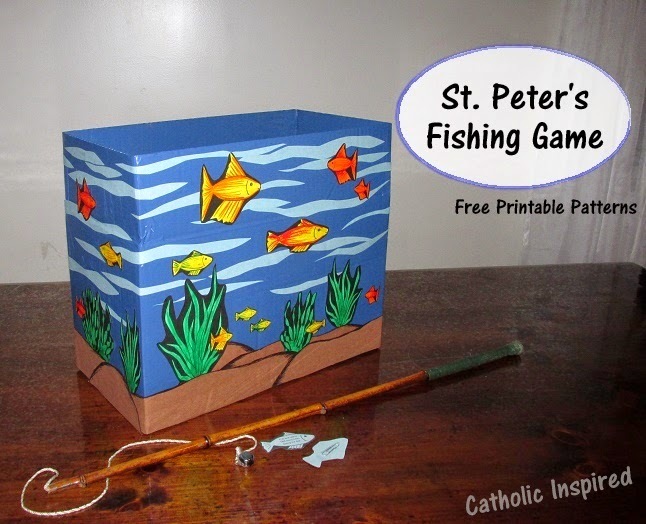 In the past, we have played this game at our All Saint's Day parties, and it's also been a fun activity on rainy days (in-doors, not outdoors - again soggy!). 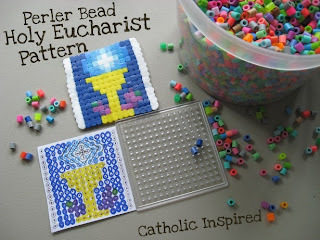 It's fun for toddlers who are learning the letter "F" and you might like to have this as a fun activity for the kids to play on St. Peter's Feast days! It can be a great surprise! The box we used is 1.5' x 2' x 9''. 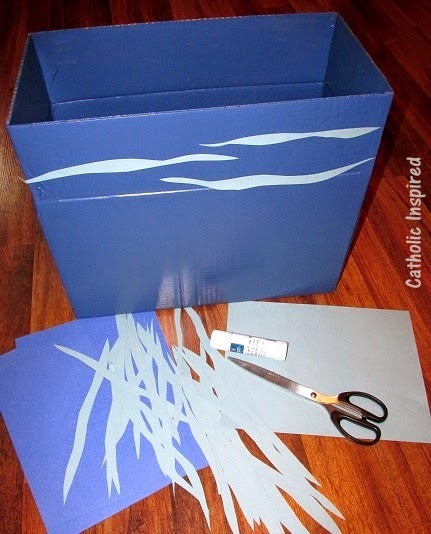 We painted this box with a medium-blue acrylic paint, but we have also made this in the past using blue construction paper or plain blue wrapping paper. Then I used wavy strips of light blue paper to make "watery-waves". I glued these onto the blue box. Then I added half-circles and half-ovals of brown paper to the bottom to make the "ground". 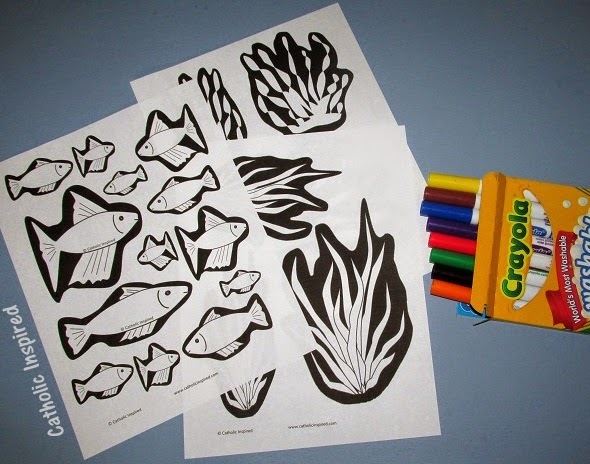 I printed out the fish and seaweed patterns and colored them with marker. Download this for free from our shop! After cutting out the fish and seaweed I glued them onto the box. 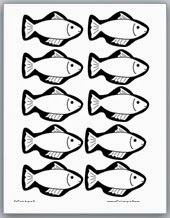 All of the fish and seaweed patterns have extra wide black lines for easy cutting. Just freely cut anywhere in the middle of the black area. The wide lines help give it a clean look! 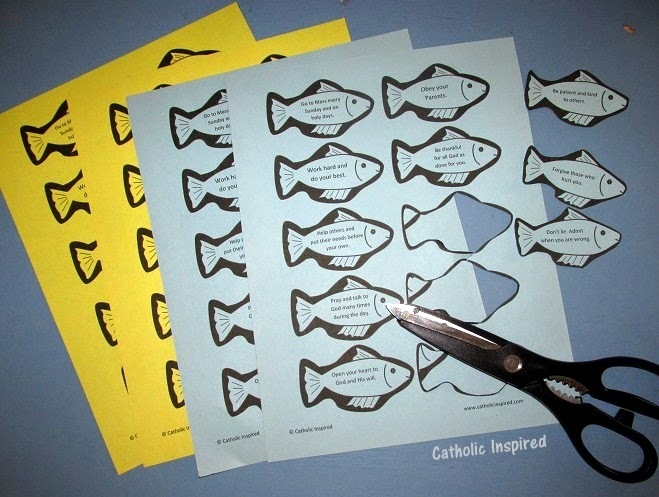 Then, print and cut out a few sets of fish to catch. 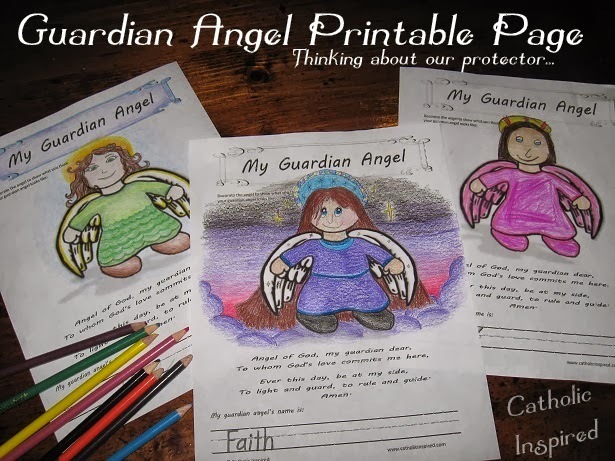 These are best printed on stock paper, but will work with regular paper. 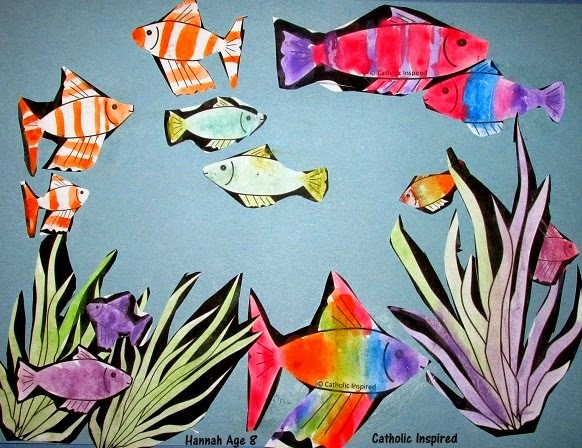 (We used colored stock paper) I have two sets of patterns for these fish. 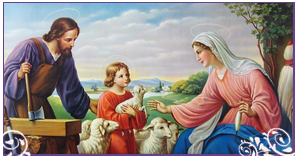 One set has virtuous actions and virtues written on them: Share, Be kind, Go to Mass, Pray, etc. 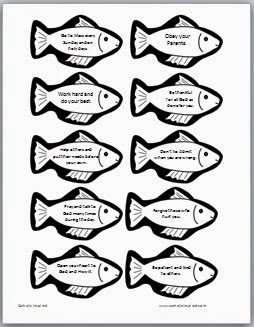 The other pattern has plain fish, so you can write your own ideas on the fish. 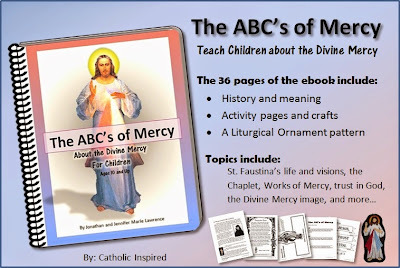 You can add anything you want the kids to learn. 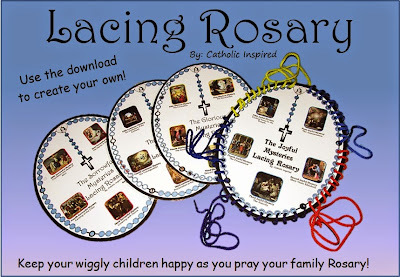 Download these for free from our shop! After you have written on the fish (if needed). Tape a paper clip to the back. 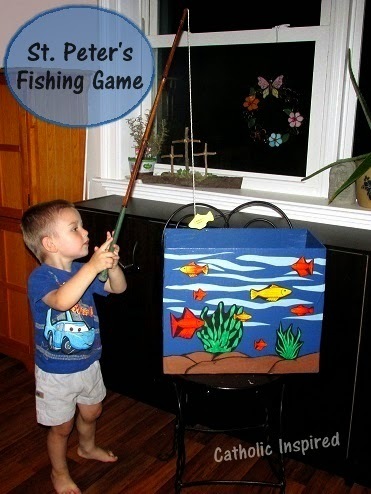 Then create a fishing rod. We made our's with a piece of bamboo, a string, and a magnet. The magnet on the end of the string will "catch" the fish! Make sure it's a strong enough magnet to attract the paper clip. 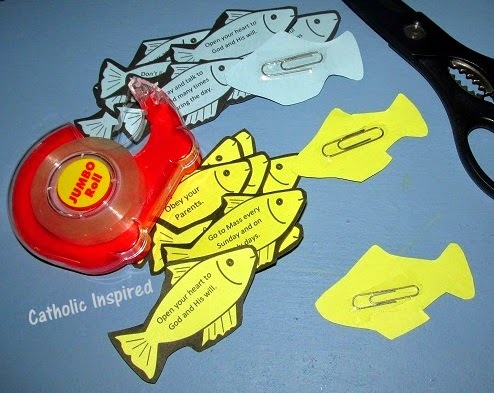 The younger kids can simply "catch" a fish and someone older can read aloud what the fish has written on it. 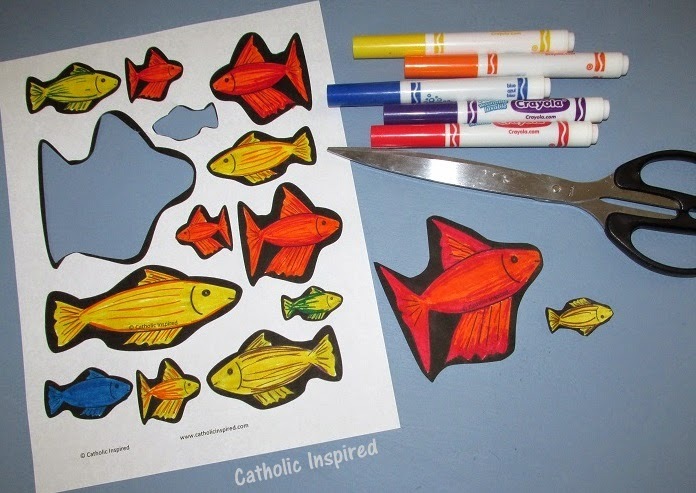 For older kids: Add two or more sets of fish -so each fish has at least one match. 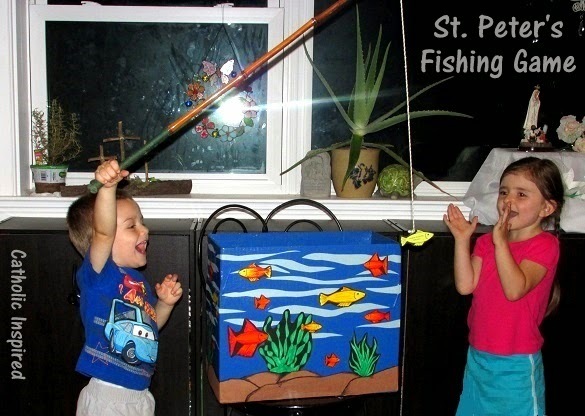 The kids should fish till they found a match to the first fish they caught. 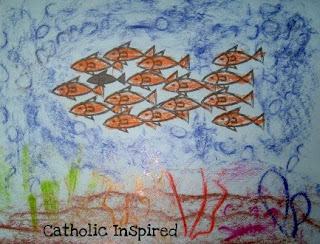 When learning the letter "F" with my young kids we also used the fish and seaweed pattern to create a fishy scene! My other art-love'n kids enjoyed making these scenes, too! Hope you all enjoy this fun game and art project! 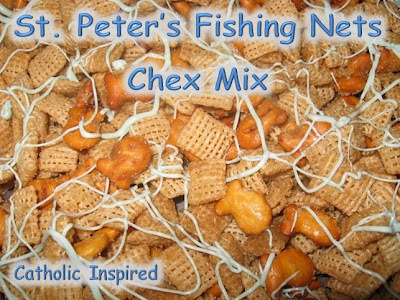 You can also Click Here to see all our St. Peter ideas! What a great idea for a game. I am using this at our All Saints Day party this weekend! Thanks for your wonderful website! I know a few mom-friends who also enjoy this site! I loved this idea and just used it for our first All Saints Day party at our parish. Everyone thought it was wonderful. 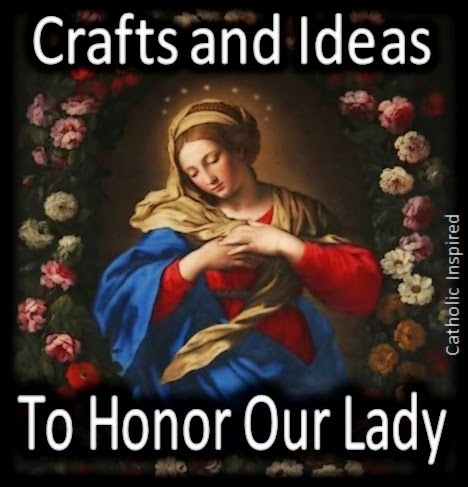 Thank you for all of your creative crafts. - Laura G.
Thanks for your comment, Laura! I'm so happy to hear of the success! It's wonderful to hear that you held an All Saint's Day party!! May God bless you for all you do in His name!